Got a late a start this morning unfortunately plus had a heckavuh time getting out of Cherbourg this morning. Every road I took kept dumping me back into town. It took an hour before I finally got on my way. 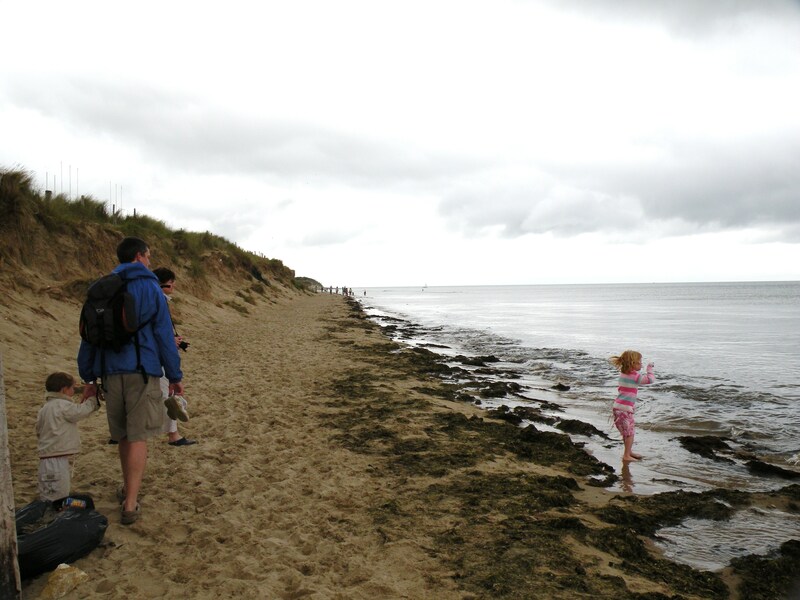 I headed for the Normandy beaches stopping at Utah Beach first. 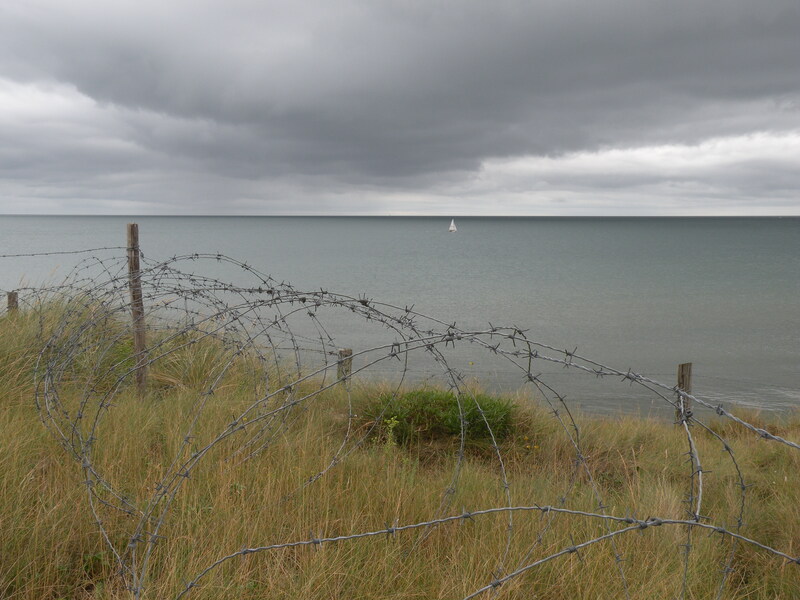 I walked the grounds where there are still some gun emplacements and plenty of barbed wire. There is a beach access and I was surprised at how high up the water came. Not much of a beach at all. I walked up the grassy path to a fence and there’s the water. And please, don’t anyone tell me it’s because of global warming. 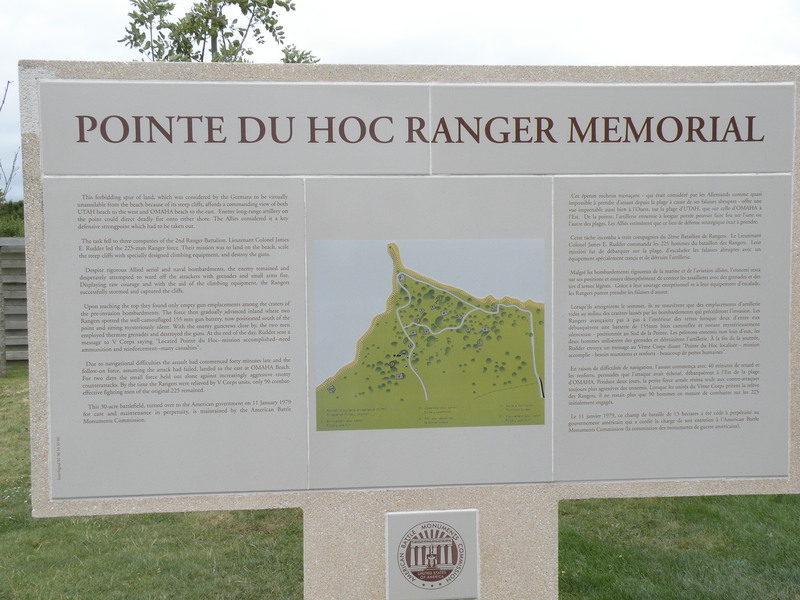 I made a quick stop at Pointe du Hoc. 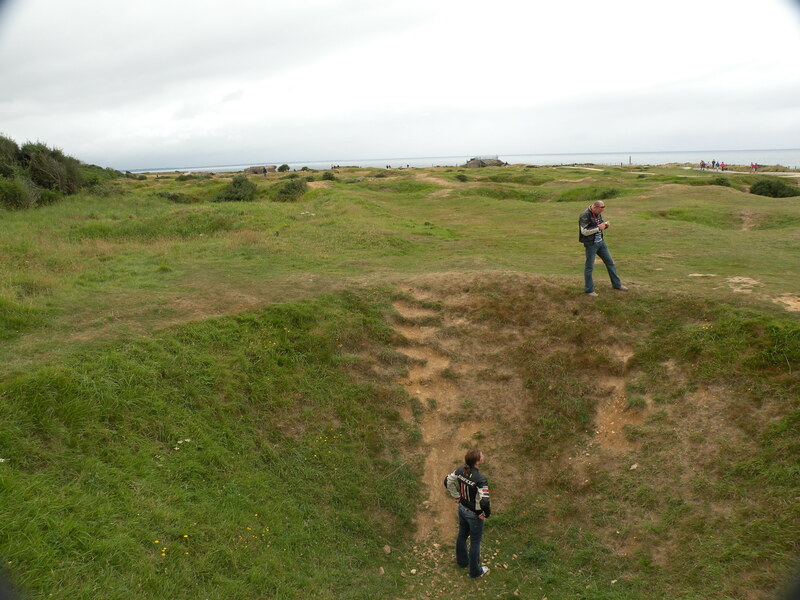 This point was home to six very large German guns capable of firing on Utah and Omaha beaches. 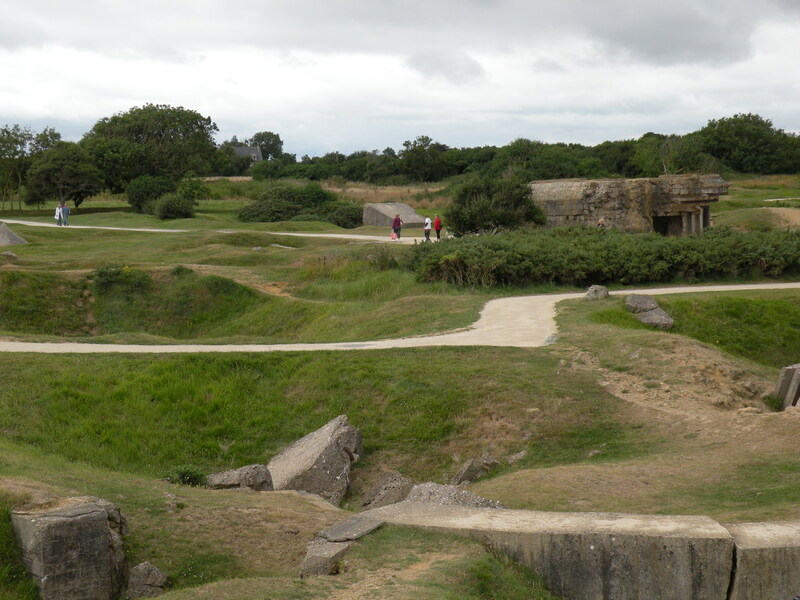 The Germans believed this location to be unassailable due to the cliffs it resided on. They had to be taken out though so a British and an American destroyer shelled the snot out of this point and the Germans that manned the guns. Then the 225th Army Rangers landed at the base of the 90 foot cliffs and scaled those cliffs and took the point. Amazing. The bomb craters are still there and they’re big. You really have to watch where you’re walking. There are so many of them, the edge of one crater is the edge of another. 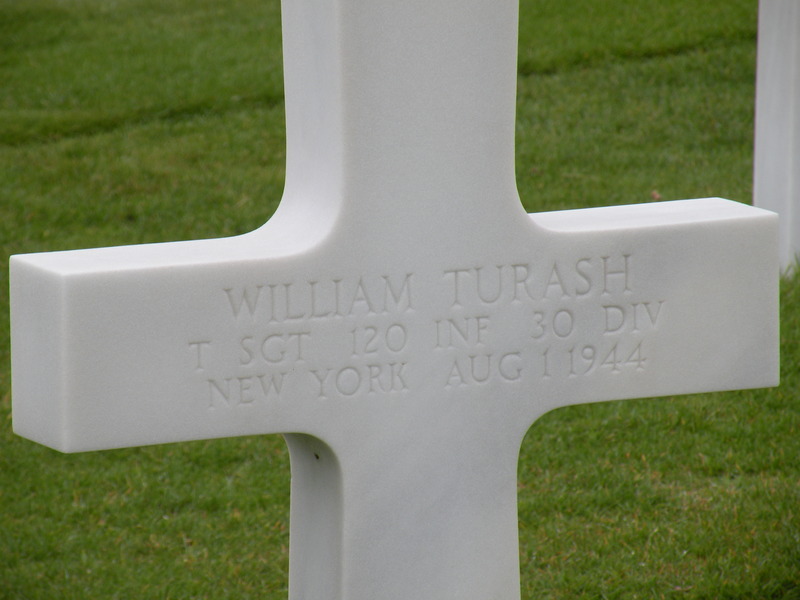 I moved on searching for Omaha Beach and the American cemetery. All of the beaches, Utah, Omaha, Gold, Juno, and Sword are each quite large and all together span about 50 miles of coastline. I didn’t realize that the landing covered that much coast. I found Omaha and was disappointed that it has become so commercialized. 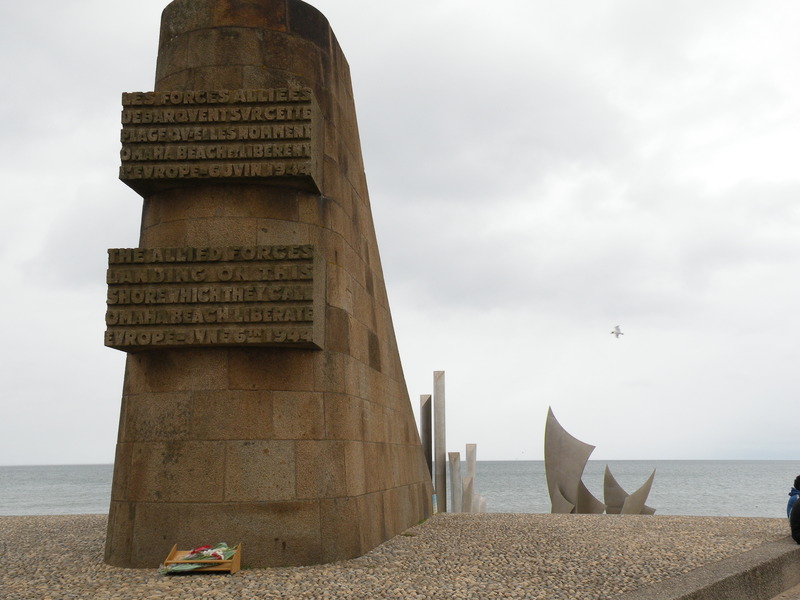 There is a memorial sculpture just in the water and all around are new buildings and homes and hotels and shops and restaurants. Just didn’t seem right. It is some prime real estate though. 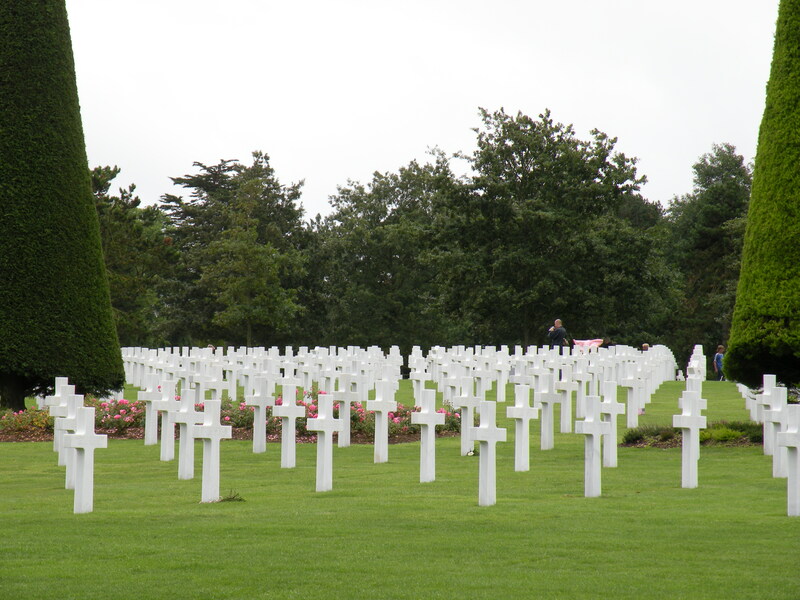 I drove further up the coast to Colleville Sur Mer and found the American Cemetery. This land apparently has been designated as US soil in perpetuity and without charge by the French government. At the entrance, there is a wonderful welcome center/museum with displays, movies, etc. Very well done. 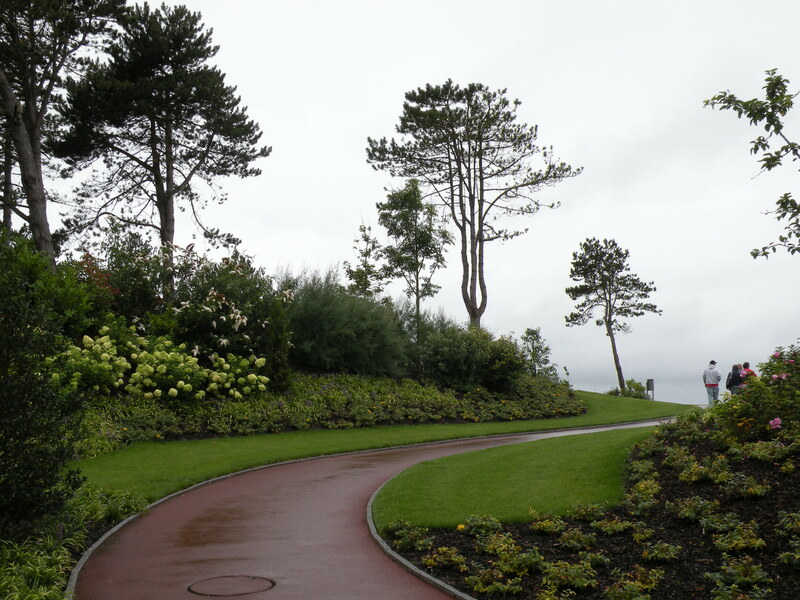 Upon exiting the center, I was struck by how beautifully the grounds were landscaped. I don’t know how to describe it other than by how it made me feel; calm and peaceful. The weather was overcast, warm, kind of muggy, and drizzling rain. It seemed apropos. As I proceeded down the path, I chose to go to the memorial first; I wasn’t quite ready for the headstones yet. 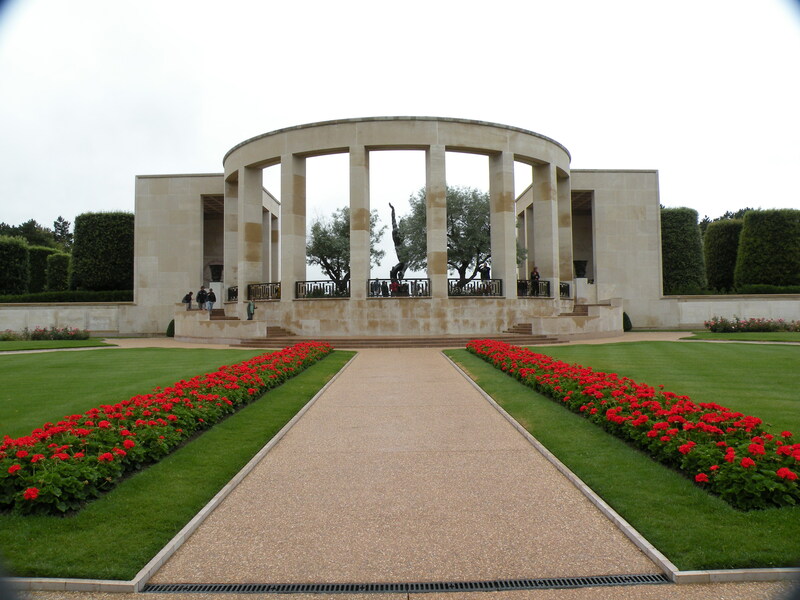 The memorial structure is impressive in its own way and is populated with a variety of flowers. 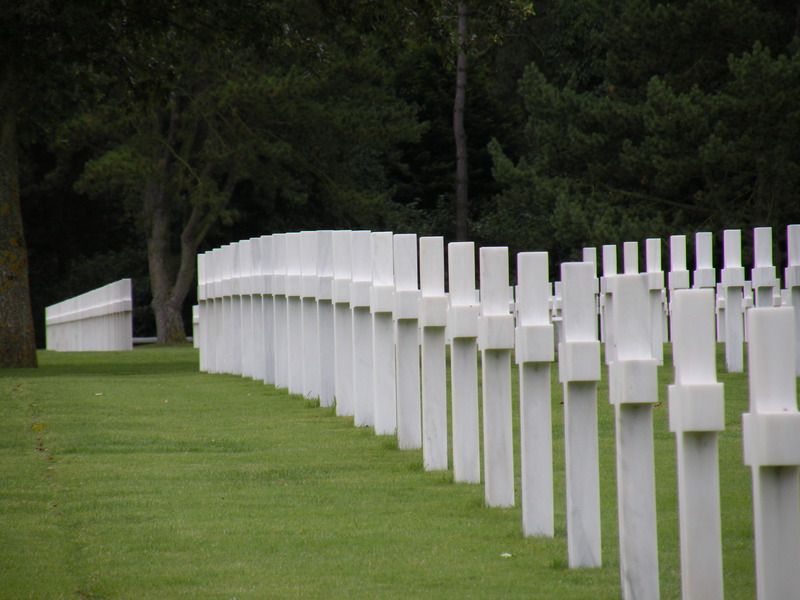 It sort of sets the mood and tone of reverence and makes clear the fact that what comes next is hallowed ground. As it came into view, I stopped dead in my tracks. I stood there for about a minute before moving forward, taking a few deep breaths, trying to keep it together. I’ve seen pictures and documentaries about the cemetery, but it just doesn’t prepare you for what you see and what you feel. A sea of 9,387 white crosses and stars of David, as far as I could see. All perfectly aligned and arranged, all perfectly clean and clearly marked. The grass was evenly cut and the grave plots each were adorned with gardens of cut shrubs and roses. Spotted throughout the grounds were unusually sculptured trees. The emotions were hard to suppress as I walked amongst them. As I went a little farther, I realized that I still could not see the end. Then I started to read some of the names on the stones and well, I just couldn’t hold it in any longer. After I got myself together, I lingered for some time, much more time than I had planned. I didn’t want to leave and I can’t explain why. 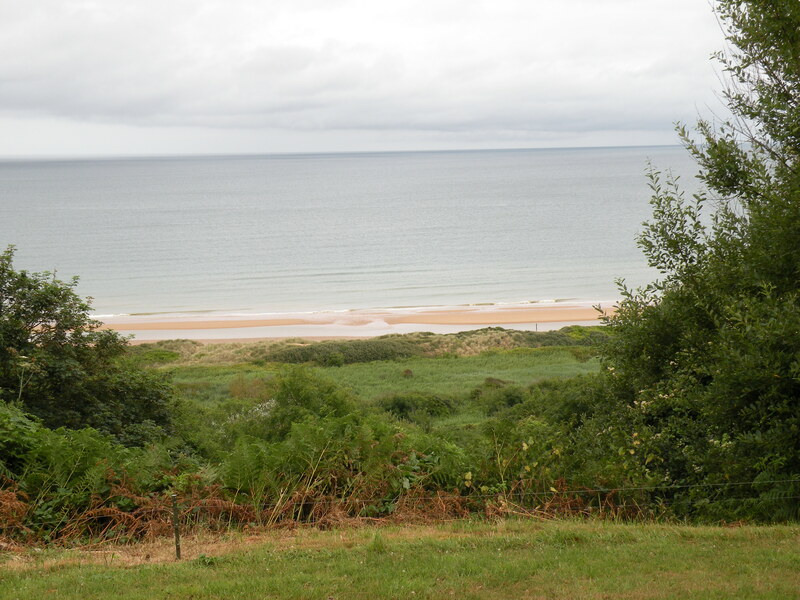 But I did eventually, and walked back along a path that overlooks a large preserved section of Omaha beach and the English Channel. There were a lot of people there and I heard some American and English accents from people just arriving, but mostly I heard French and German speakers. And the parents all shushed their children if they got too loud. I think they truly respected and honored the place and the event and those that lay there. I focused on one family as they were walking in and they were talking amongst themselves. They were speaking a mix of French and English, not sure why and I never figured out where they were from, they could have been Americans for all I know. I heard the little boy say to his father, “daddy, where are the American heroes?” C’mon, really? Who says stuff like that? A 10 or 11 year old kid? I’m really not making that up. I saw lot’s of parents walking with their kids through the markers explaining to their kids what happened here. Wow. If that doesn’t bring a tear to your eye, you’re cold. After that experience, I was spent and it was late in the day and I had a two to three hour drive to get to my next destination. I was planning to visit the Canadian cemetery as well, but just ran out of day. 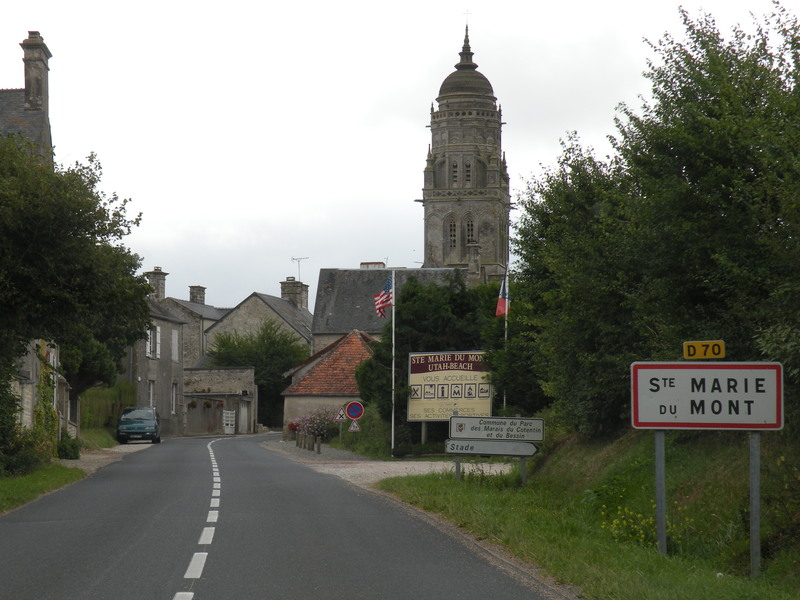 To do the whole Normandy experience right would take two or three days. 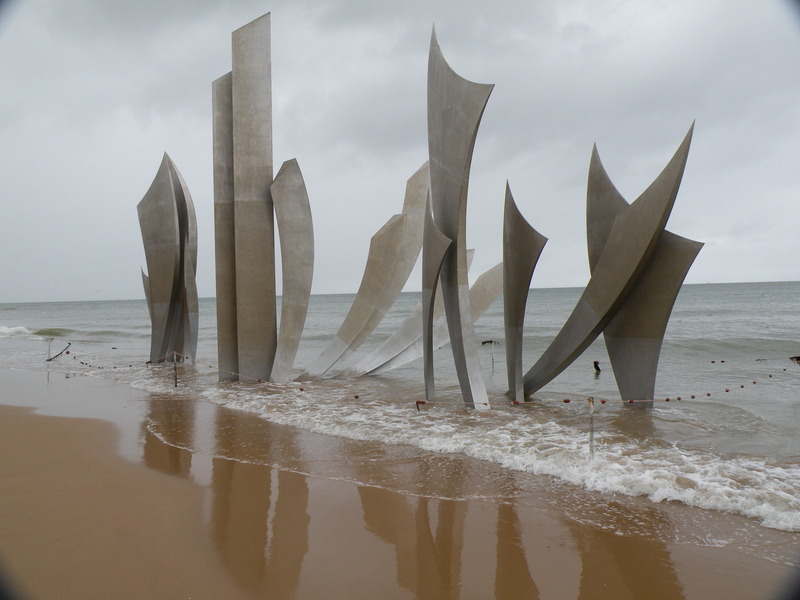 But I did want to mention that the Canadian 2nd Army Corps, on that June 6 day in 1944 took Juno Beach and over the next several days made assaults between Caen, Falaise, Chambois, and as far as the Seine River and they paid a heavy price. 5,007 Canadian soldiers lay in two cemeteries here. I made it to Vernon with some daylight left, thank goodness, because I never would have found this place in the dark. It was tough enough in the day, but well worth the effort. 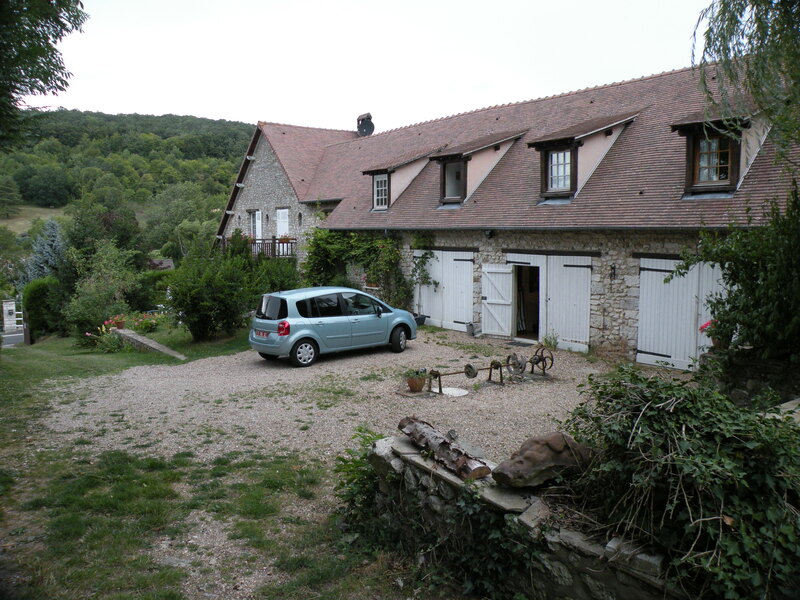 I’m staying at the Champ du Renard, a B&B run by Nanou and Jean Luc. It’s a lovely old farmhouse in lush hills. My attic room is old and rickety and it’s awesome. A windstorm has kicked up and I just heard thunder in the distance. This is too cool. Maggie, I have only read a few days so far but your Normandy info is wonderful. I will be there next year for my first time and I know I will feel a lot of the same feelings you expressed. My dad landed @ Cherbourg about a month after D-day. Thanks for a wonderful journal. Hi Maggie, We’re so enjoying your travels. You’re such a good writer. I hope all your friends appreciate how much time you’re putting into this web stie. Much better than a post cad!! Sounds like you better learn how to ask for directions slowly or just ask for written directions. We’re glad you’re getting along fine and experiencing a lot.